Environment Minister Shri Prakash Javadekar addressing a press conference to mark the completion of one year of the NDA government in New Delhi on June 08, 2015. Environment Secretary Shri Ashok Lavasa and other dignitaries are also seen. 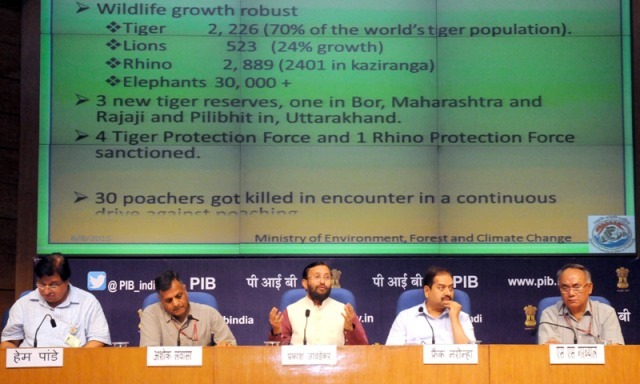 The Environment Minister Shri Prakash Javadekar recently made a powerpoint presentation to highlight the achievements of the Government of India in the last one year in protecting the environment and wildlife of India. The Minister mentioned several pointers, achievements, proposals and plans which have been highlighted below. On the face of it, it does seem that the present Government is trying its level best to protect and safeguard the environment and natural resources of India. However, it becomes the responsibility of each and every citizen to follow-up and constantly work with the Government to ensure the success of each such initiative as well as verify each achievement mentioned. Burnt confiscated wildlife articles. State inventory ordered. National Forest Policy being revised to ensure more greening, improving forest quality with participation of tribals and forest dwellers. 14th Finance Commission has given 7.5% weightage for forest cover and has provided for nearly Rs. 55,000 crore for afforestation. New Diploma and Degree courses in Animal Welfare to be launched. National Mission on Himalayan Studies established: This will remove data deficit on glaciers, landslides, sustainable methods of building roads and tunnels, weather and other related issues. Comprehensive Air Quality Index launched in 11 cities. Everyday bulletin at 5 PM on 8 parameters; PM-10, PM-2.5, SOX, NOX, O3, Lead (Pb), CO, NH3. Environmental norms for sand, stone-crushing, brick-kiln, fertilizers, chemicals, pharmaceuticals, paper and pulp, paint, distilleries and other sectors are being reviewed. Non-complying 124 industries closed. Harmonised system proposed for Red, Orange and Green categories based on pollution potential of Air, Water and Hazardous Waste. These will ensure scientific waste management at all levels. The Notifications are open for consultations till 31st July 2015 and can be accessed on the MoEFCC website. 64 polluting and non-complying industries on the banks of River Ganga and 61 industries throughout the country closed. Units are allowed to be reopened only after complying with the pollution norms. Technology-based monitoring system being expanded for forest appraisal, wildlife management and pollution control. Drones, electronic surveillance, camera traps, 24×7 pollution monitoring devices, geo-mapping being increasingly used. Education and industrial complexes are exempted from EC with more stringent environmental standard conditions. Consultation with stakeholders on High Level Empowered Committee under TSR Subramanian is near completion.